As a neuroscientist, and the mother of two children, I have always wanted to know how little ones’ brains work. According to some websites I had read, electrical activity had been recorded from the brain of a human fetus only six weeks and three days after conception (1). That would be just three weeks after the fetal heart starts beating (2), and one week after the earliest-recorded fetal movements (3). But, as any neuroscientist will tell you, it is difficult to record electrical activity from adult human brains using electroencephalography (EEG) due to interference from the scalp muscles and cranial bones. How could a baby the size of a grape produce enough electrical activity to be detected? I set out to find the original research and determine if it was done well. I expected that electrical signals coming from the mother’s muscles would mask those from the brain of the unborn child. Worse, most researchers use fetal EEGs to record brain activity in babies during childbirth or in the last trimester of pregnancy. In fact, all the papers posted publicly online quoted the brain research on babies in the first trimester second-hand. I began to fear that the claim that a 45-day-old fetus shows brain activity was wrong. To find the answer, I had to visit the Library of Congress and dust off a scientific paper so old it is not publicly available on the internet. The paper detailed brain research that took place during tragic medical emergencies in Philadelphia in the 1950s. In 1955, Winslow Borkowski and Richard Bernstine, doctors at Jefferson Medical College Hospital, temporarily preserved a tiny unborn child removed 45 days after conception during an ectopic pregnancy and recorded from the frontal and occipital areas of its brain. The team used needle electrodes to record brain activity at 3 millimeters and 1 centimeter below the brain surface (4). These electrodes penetrated the cranial tissue, which solves the problem of electrical interference from nearby muscles. At 45 days after conception, the brain is bent forward and is almost as large as the entire body of the fetus, allowing for these deep recordings (5). Typically, doctors record brain activity, or EEGs, using electrodes placed on the scalp. By using an electrode that actually goes inside the brain, doctors and scientists get a more accurate recording because the electrodes detect more neural activity than muscular activity when the electrode is surrounded by neural tissue. 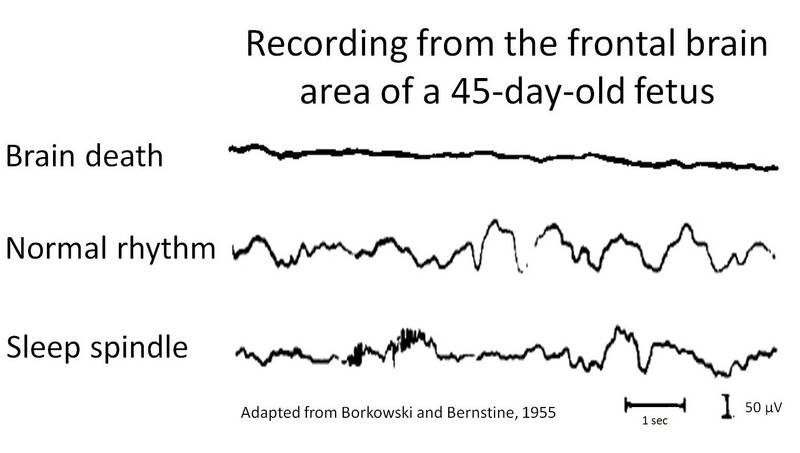 Borkowski and Bernstine’s recording technique is the most reliable method for recording EEGs, but it also causes permanent brain damage, and therefore is only used in animals or humans with uncontrollable seizures. In this case, the fetus had only minutes to live, so the invasive scientific technique was not considered unethical. Notably, use of this technique on babies born too early to survive ended, to my knowledge, in 1961 (6). The doctors started recording from the 45-day-old fetus 10 minutes after the surgery that separated it from the maternal blood supply and continued recording for almost 90 minutes until complete brain death, determined by the complete lack of EEG activity (4). While it may be surprising that the fetus’s brain activity continued for so long after separation from the oxygenated blood flow of its mother, neonatal neurons have protective mechanisms to help them survive metabolic distress and low-oxygen environments (7). Convinced that the evidence for human brain activity at 45 days after conception was strong, I turned to the question of what we can learn from these fetal EEG recordings. Electroencephalograms (EEGs) record the spontaneous electrical activity generated by active neurons in the brain. In general, the brain produces electrical activity divided into two parts – simultaneous rhythmic components, often called brain waves, and event-related potentials, related to sensory stimulation or task-related thinking. Scientists observing an EEG cannot tell what a person is thinking and feeling, but event-related potentials show that the brain is sensing and perceiving its environment. Event potentials are also easy to detect from the scalp or, in the case of an unborn child, from electrodes on the surface of his mother’s belly. From external measurement, we know that a 26-week-post-conception fetus responds to sounds with event-related potentials (8), but technical limitations prevent researchers from getting clear data at earlier gestational ages. Slow-wave activity is observed during deep sleep. Faster rhythmic activity can be seen during movement and tasks that need attention. Finally, the absence of any EEG activity indicates brain death. 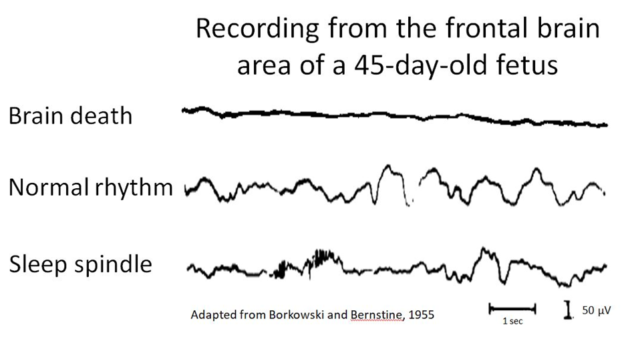 When Borkowski and Bernstine studied the 45-day-old fetus’ brain, they observed patterns of brain activity they described as similar to those observed in older fetuses (6). Normally developing fetuses, healthy preterm infants, and full-term newborns show two main EEG patterns: “discontinuous” activity and “trace-alternant” activity (9). Discontinuous activity is a mixture of slow-wave activity and bursts that resemble event-related potentials. Trace-alternant activity refers to sharp bursts of electrical activity followed by multiple rhythms with high amplitude. Scientists have posited that trace-alternant activity represents quiet sleep, and discontinuous activity represents wakefulness or rapid eye movement sleep (10). Older preterm infants show more trace-alternant activity than younger preterm infants, suggesting that trace-alternant activity increases with fetal maturity (11). As mentioned earlier, “sleep spindles” commonly appear in the EEGs of adults during lighter sleep. In the adult, “sleep spindles” correlate with the strengthening of connections between neurons and may help form long-term memories (12). It is possible that they serve the same purpose in the fetus; however, the fetal brain is not simply a miniature adult brain. It develops from the inside out. Specifically, deep subcortical areas develop first. As the cortex starts developing, it forms internal circuits first. Anatomical projections from the subcortical areas to the cortex only appear in the second trimester. Projections using monoamines, such as dopamine and serotonin, form first between 12 and 16 weeks, and excitatory projections form later between 20 and 23 weeks post-conception (9). Sleep spindles typically arise from reciprocal connections between a deep subcortical structure – the thalamic reticular nucleus – and the cortex (13). However, the connection between the thalamic reticular nucleus and the cortex would not yet have developed in a 45-day-old fetus. Given that the fetal EEG recordings came from the superficial frontal and occipital areas, these recordings likely show activity coming from deep brain regions juxtaposed with activity from internal cortical circuits (5). If the absence of brain activity signals brain death, then the presence of brain activity indicates brain life. Science clearly shows that a unique human individual forms at conception. If the presence of brain activity indicates a life worthy of medical intervention and protection in a human outside the womb, then why does it not warrant protection for a human inside the womb as well? In truth, fetal brain activity may start long before 45 days’ gestation. Learning about the life and experience of the young fetus is a scavenger hunt: scientists must piece together clues from observations made during unhealthy pregnancies and emergencies to gain insight into the healthy development of the human child. While, as a mother, I am eager to know when my unborn child starts to have brain activity, I am even more grateful that our society cares more about the safety of the unborn child than the advancement of scientific knowledge. As we develop new technologies, we may learn a great deal more about the in utero experiences of the fetus, but the first priority must always be the safety of mother and child. Katrina Furth, Ph.D. is a neuroscientist and an associate scholar with the Charlotte Lozier Institute. de Vries JIP, Visser GHA, Prechtl HFR. The emergence of fetal behaviour. I. Qualitative aspects. Early Hum Dev. 1982 Dec 30;7(4):301–22. Borkowski WJ, Bernstine RL. Electroencephalography of the Fetus. Neurology. 1955 May 1;5(5):362. Bernstine RL. Fetal electrocardiography and electroencephalography. Springfield, Ill: Thomas; 1961. 97 p.
Pfisterer U, Khodosevich K. Neuronal survival in the brain: neuron type-specific mechanisms. Cell Death Dis. 2017 Mar;8(3):e2643. Draganova R, Eswaran H, Murphy P, Lowery C, Preissl H. Serial magnetoencephalographic study of fetal and newborn auditory discriminative evoked responses. Early Hum Dev. 2007 Mar 1;83(3):199–207. Anderson AL, Thomason ME. Functional plasticity before the cradle: A review of neural functional imaging in the human fetus. Neurosci Biobehav Rev. 2013 Nov 1;37(9, Part B):2220–32. Thaler I, Boldes R, Timor-Tritsch I. Real-Time Spectral Analysis of the Fetal EEG: A New Approach to Monitoring Sleep States and Fetal Condition during Labor. Pediatr Res. 2000 Sep;48(3):340–5. André M, Lamblin M-D, d’Allest AM, Curzi-Dascalova L, Moussalli-Salefranque F, Nguyen The Tich S, et al. Electroencephalography in premature and full-term infants. Developmental features and glossary. Neurophysiol Clin Neurophysiol. 2010 May 1;40(2):59–124. Holz J, Piosczyk H, Feige B, Spiegelhalder K, Baglioni C, Riemann D, et al. EEG sigma and slow-wave activity during NREM sleep correlate with overnight declarative and procedural memory consolidation. J Sleep Res. 2012 Dec 1;21(6):612–9. Gardner RJ, Hughes SW, Jones MW. Differential Spike Timing and Phase Dynamics of Reticular Thalamic and Prefrontal Cortical Neuronal Populations during Sleep Spindles. J Neurosci. 2013 Nov 20;33(47):18469–80. EEG recordings from 45-day-old fetus removed during an ectopic pregnancy. Brain death occurred last, approximately 91 minutes after separation from the uterine arteries.